+ Sourcing fee 166 ( 166 + 719 = ` 885 ). This is a beautifully packaged invitation to the peace and joy that comes from knowing that God cares about our dreams, hopes, and lives. 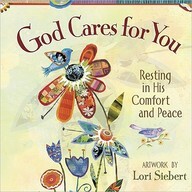 Lori Siebert's trademark whimsical images create a haven for sentiments of solace and inspiration. Among glad-hearted designs, uplifting quotes and sweet words of faith and comfort remind readers of God's love during difficulties and in the midst of life's routine. This sanctuary of grace and gratitude will lift the spirits of family, friends, neighbors, and anyone who could use the embrace of simple beauty and God's ever-present, tender care.